Spirits. Politics. African Classical Music. With the plethora of books available about Fela’s life you would think that just about every aspect of his eventful life has been covered. But there is one central aspect of his life that, until now, was only alluded to in th e biographical works. It was shown in the documentary “Music is The Weapon” that Fela performed religious rituals in The Shrine and that he surrounded himself with African mediums that contacted the Spirit World. From the name of his backing band we know he had a preoccupation with ancient Egypt. If you weren’t a resident of the Kalakuta Republic it would be difficult to know how all these elements tied in with each other. Majemite Jaboro spent several days in a Nigerian prison cell with Fela Kuti and several of his band members. 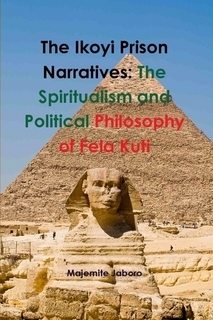 To pass time Fela recounted his life story, this narrative is the basis for this book. The book starts with a short bio of Fela up until the point that Jaboro became his Personal Assistant and later Shrine Priest. He goes into great detail describing Fela’s religious and political worldview and everyday life in the Kalakuta Republic. He sums up the esoteric books Fela was reading. He concludes with describing Fela’s final days suffering from Aids, and his funeral. If you’re new to Fela this is definitely not the book to start with. Fela’s autobiography and several of the other books on this page give a much more balanced view of Fela’s life. The two drawbacks of the book are that, first of all, it could have done with some editing. And secondly, you have to be a bit of a Felaologist to be able to follow the narrative and know the names of Fela’s numerous (ex-)wives, children and band members. Posted on March 26, 2013 by felastory	• This entry was posted in Uncategorized and tagged Africa, Afrobeat, Fela Kuti, Lagos, Majemite Jaboro, Nigeria, Spiritualism. Bookmark the permalink. spiritualism is not a best way to spiritual life.Fela is a singer yoruba turn to Christ. PARVATHI on ARE WE IN THE END TIMES?